You’ve undoubtedly heard “If you’re going to do it, do it right.” What constitutes “right” is often arbitrary, and depends on the situation. Let’s specify that here, we’re talking about grinding coffee beans. The type and performance of your coffee grinder has a lot to do with how your coffee tastes, so choosing the right one is an important step in the brewing process. Sure, you can find tons of ground coffee at the grocery store, ready to brew with no effort or waiting. Why not just buy that? Well, it comes down to whether you want just an OK cup of coffee, or the best cup of coffee you can brew. Why Grind Your Own Coffee? In a word, flavor! Coffee’s flavor comes from the oils in roasted beans, and those oils need to be released evenly for the best-tasting coffee. 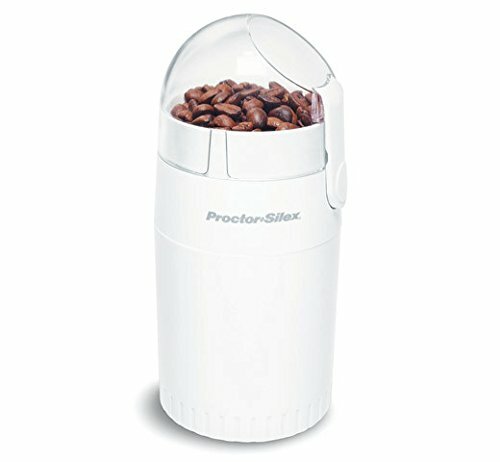 So you want to extract the flavor from the beans as effectively as possible, and that means starting with the best coffee grinder you can buy. If you’re a coffee connoisseur like us (of course you are, or you wouldn’t be here), you’ve probably invested heavily in your coffee maker and beans. But you may have overlooked the importance of the grinder, and its role in producing the final flavor you’ll be sipping. Not only is it an easier way to grind coffee beans, using a grinder also allows you to alter the consistency of your grinds, depending on your brewing method of choice. French press? Drip? AeroPress? You can fine-tune the output of your grinder to suit your coffee maker, and change the flavor by grinding the beans on a finer or coarser setting. Go ahead and test it out, and experience a whole flavor spectrum from just one type of bean. This is another reason why choosing your grinder wisely is so important. 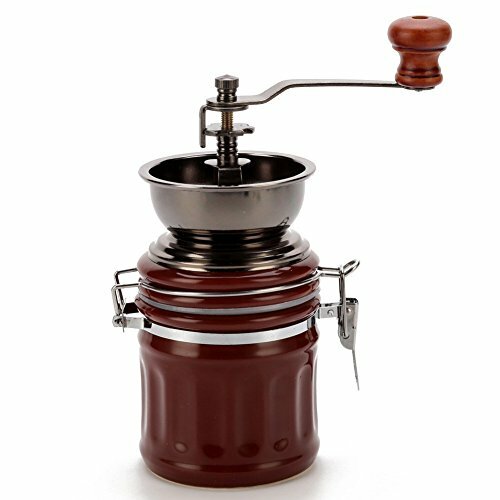 But before you can choose a specific grinder, the first choice to make is what type of grinder you want. 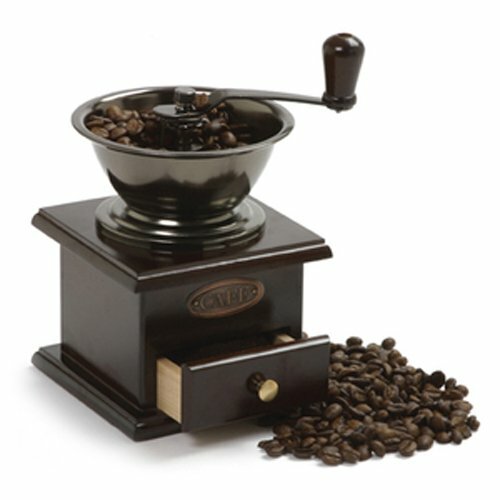 Coffee grinders perform the action of grinding beans in two main ways: with blades, or with burrs. Of course you understand how blades work. They cut things up. But is that an effective way to grind coffee? And just what the heck are burrs and how do they work? More importantly, are they better than blades? With two oscillating, serrated plates (known as burrs) that come together to crush and literally grind the beans rather than cut them, burr grinders produce uniformly sized grinds. And when it comes to coffee grinds, size does matter. By adjusting the distance between the burrs, you have plenty of control over the resulting size and consistency of the grinds. Burr grinders are the grinders of choice for pro baristas, and we highly recommend them. 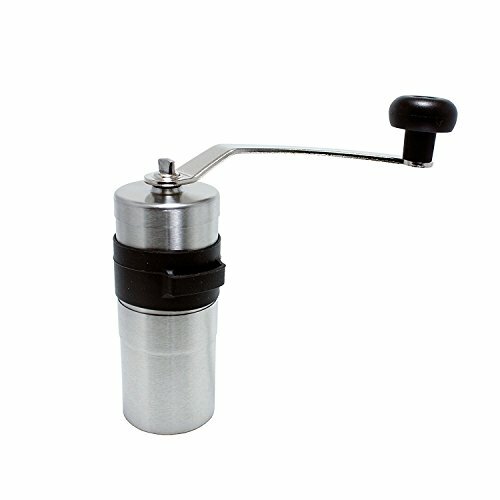 The burr grinder is a foolproof method to achieve the even oil extraction you’re looking for in order to optimize flavor. Like a plane’s propeller indiscriminately slicing up the beans (in fact, it’s sometimes called a propeller grinder), the blade inside this type of grinder produces coffee grinds that are less uniform in size than a burr grinder. For this reason, the resulting flavor of coffee ground by a blade grinder is inferior to that produced by a burr grinder. The blade grinder is still fairly effective in its task, though, and a nice option for the budget conscious. And blade grinders are still a cut above (no pun intended! OK, maybe a little intended) bags of pre-ground coffee. If you’re not quite ready to switch over to a burr grinder, try using the one at the grocery store. We’re willing to bet once you taste the difference, you’ll be in a hurry to invest in a burr grinder, and better coffee. In a world focused on instant gratification, taking the time to do something as simple as grind your own coffee beans might seem like an unnecessary roadblock on the path to your morning cup of joe. If you want the best flavor in the least amount of time, or you’d just rather squeeze in a couple more minutes of sleep in the morning, look for an automatic coffee grinder. They’re available with blades or burrs, and you can find one to fit your budget. 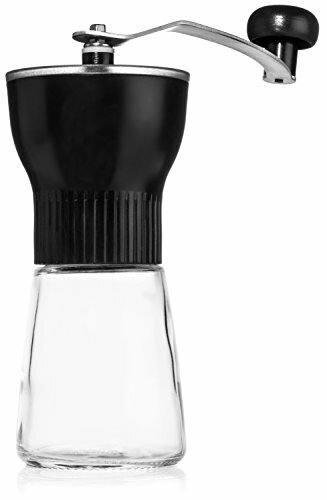 Then again, good things really do come to those who wait, and while using a manual coffee grinder might slow you down a bit, hand-ground beans transform and elevate your coffee with flavor and richness you may not get from an automatic coffee grinder. 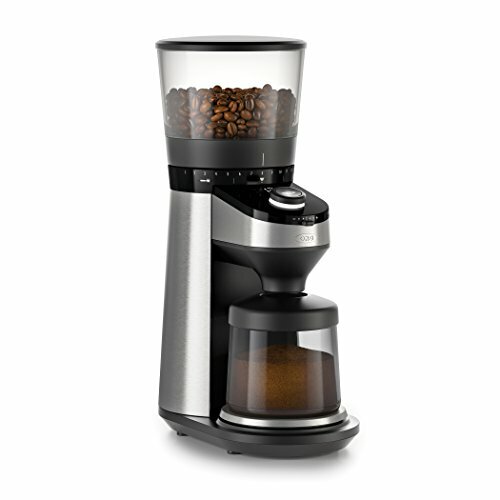 Don’t get us wrong—we can appreciate a high-quality automatic coffee grinder as much as the next coffee lover. Automatics definitely have the advantage when it comes to speed and convenience. You can pour in the beans, hit a button, and kick back as you wait for your coffee to grind to the your preferred level. No fuss, no muss. This model delivers quite a bang for the buck. It’ll look great sitting pretty on the kitchen counter. Then, when you actually use it and explore its long list of features, the price seems even more reasonable. Its 18 grind options allow you to grind from 4 to 18 cups of coffee at a time. No matter how much coffee you need or how picky you are with your grinding requirements, this little coffee grinder could be just what you need to make your next cup of coffee taste amazing. 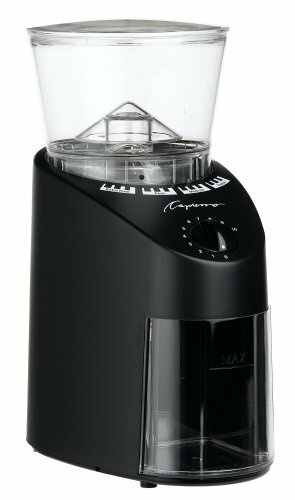 This is a professional-grade coffee grinder boasting every feature you could hope to have when grinding your coffee. 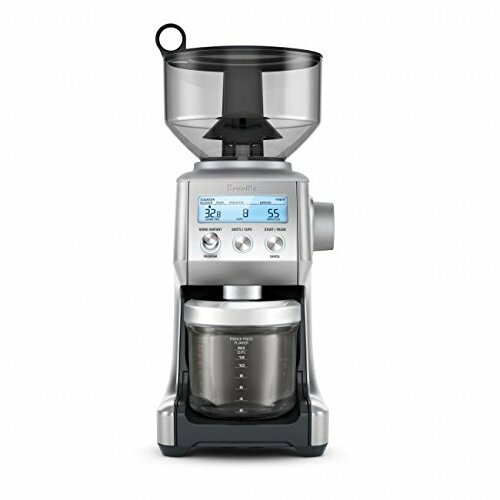 It has 230 different grind settings, as well as digital timers that can be set to grind a precise amount of coffee. The 54mm ceramic flat burrs guarantee an impeccably even grind. Whether you’re buying a grinder for commercial use, or you take your coffee seriously at home, this machine will not fail to impress. While more affordable than professional-grade grinders, this model shares many of the same features as its professional counterparts, such as multiple grind settings (60 to be exact), and digital timers to make the grinding process simpler for you on a daily basis. If you’re ready to graduate to a quasi-professional level with your coffee art, this is the grinder for you. Back to basics on this one. It’s a simple, stainless steel blade grinder, compact and sturdy. Don’t bother searching for multiple grind settings here—it’s a one-stop shop. However, here’s a tip – if you want a fine coffee grind, try shaking the grinder in between grinds. A hassle, but somewhat effective. This option is affordable and reliable, making it a great choice if you’re a budget-conscious coffee lover. This handy appliance is designed to provide no-nonsense ease of use. As in, just put your coffee beans in and press the button. Voilà! Ground coffee. However, it does lack the advanced features found in other, more expensive coffee grinders. 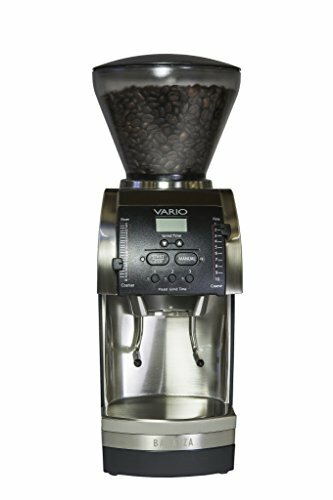 If you don’t want or need complicated settings, but still want to grind your own beans, look no further. Perks of this design include a safety lock and built-in storage for the power cord, which is always a nice space saver. 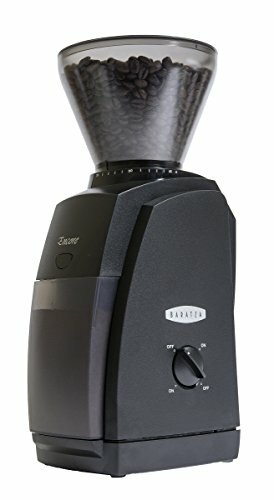 The Baratza Encore has a reputation for being the entry-level grinder for coffee aficionados. It boasts 40 different grind settings. More good news: the motor keeps the beans cool during extended grind times. Yes, this is more expensive than many basic grinders. But, you get what you pay for: settings used by the pros. It has 16 different settings, allowing you to play with variety. For example, for a French press, we recommend a coarse grind. No problem here. With this grinder, you can also pulverize those beans if you’re going the espresso route, and every size in between. It has a built in timer, and can hold up to eight ounces of beans. If you’re familiar with the OXO brand, then you know it means quality, and this coffee grinder is no exception. It features a built-in scale so you can always use just the right amount of coffee without wasting it. With 38 settings, you can grind coarse to fine and everything in between. The high-torque, low-speed motor won’t overheat the beans, and built-in overheating detection offers additional protection, and prolongs the grinder’s life. Automatic shutoff guarantees the precise amount of coffee every time. With roots stretching back to the first roasted coffee bean, hand-grinding coffee is a long-held tradition. Cowboys of the Old West often smashed coffee beans with the butts of their guns before tossing the grounds into boiling water to make cowboy coffee. Soldiers in the Union army had to rely on coffee grinders built into the stocks of their rifles for their morning cup of mud. 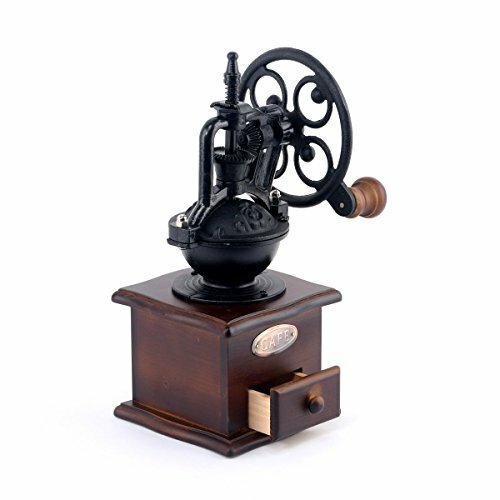 Thankfully, modern manual coffee grinders make it easy and fun for you to enjoy grinding as a choice, rather than a necessity. And without any weaponry. 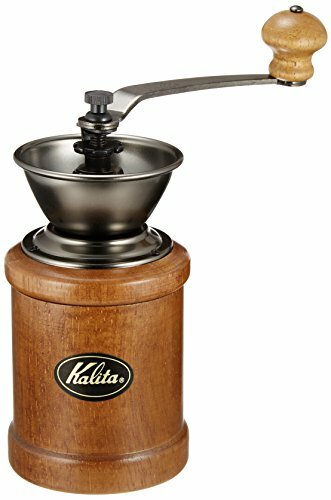 Kalita welcomes newcomers to hand-ground coffee with this basic ceramic burr grinder with an adjustable grind. This won’t be the last coffee grinder you buy—it’s not as durable or as powerful as its competitors—but it’s a good place to start your hand-grinding journey. If you’re planning to do most of your coffee grinding at home, this moderately priced, old-school grinder might be right up your alley. It features an adjustable grinder and a storage drawer, as well as some serious old-world charm as countertop décor when not in use. Modern convenience meets vintage sensibilities in this manual coffee grinder. Designed to balance aesthetics with functionality, Foruchoice’s stainless steel grinder has a rugged cast iron exterior with plastic and stainless steel in the actual mechanism. It’s best for light daily use at home rather than heavy-duty or portable grinding. Focused on portability and ease of use, this stainless steel grinder from Japan is the ideal no-nonsense travel companion for coffee lovers. A minimalist marvel, this grinder will handle everything from fine espresso to French press coarse grind, and is also compatible with the AeroPress maker for maximum convenience. 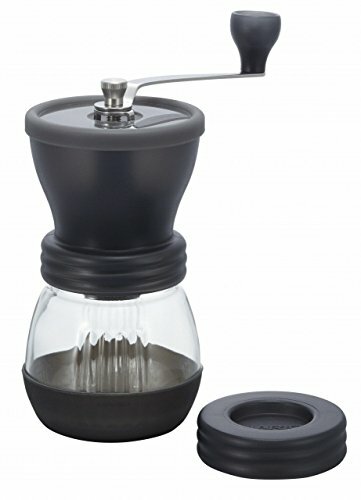 This hardworking little grinder makes and holds enough ground coffee for two people in one sitting. It’s portable, easy to clean, and has an adjustable ceramic burr grinder with 18 settings, so you can enjoy espresso, pour over, or French press coffee even in the middle of the woods. The mechanism is also strong enough to handle spices, but you might want to buy two to avoid giving your coffee an unintended spice blast! If you’re after good looks and resealable storage with the convenience of an adjustable grind, look no further. This affordable ceramic grinder from 3e Home lets you control the fineness of your your grind, gives you portable storage for coffee on the go, and adds charm to any setting. If you want an easy and portable way to grind, brew, and enjoy your coffee on the go, this little beauty might just be your new best friend. 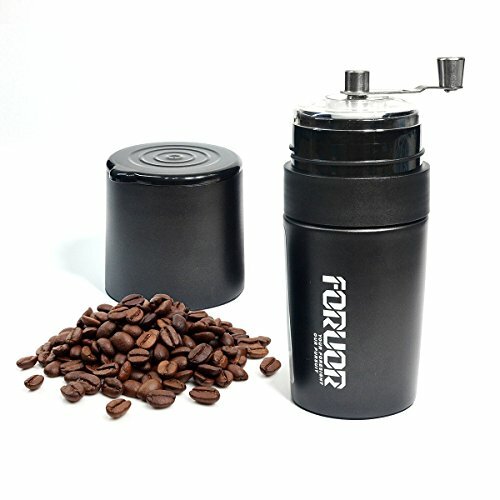 Combining a blade grinder, easy-to-clean filter, and insulated cup into one gadget, FORUOR’s portable coffee system makes it easy to enjoy freshly ground and brewed coffee just about anywhere. Easy to use, carry, and clean, this modest marvel is our favorite basic manual coffee grinder. 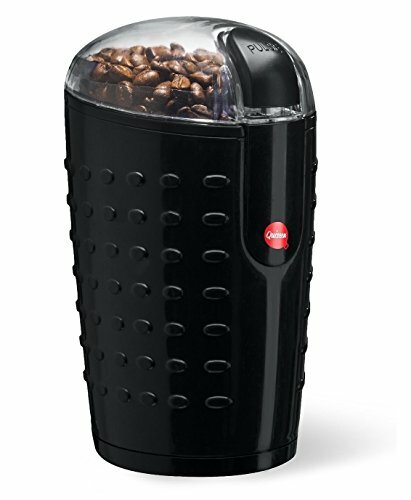 Its ceramic burr grinder and dual lids make it easy to grind and store coffee on the go. It’s as at home in your suitcase as it is your kitchen cabinet. 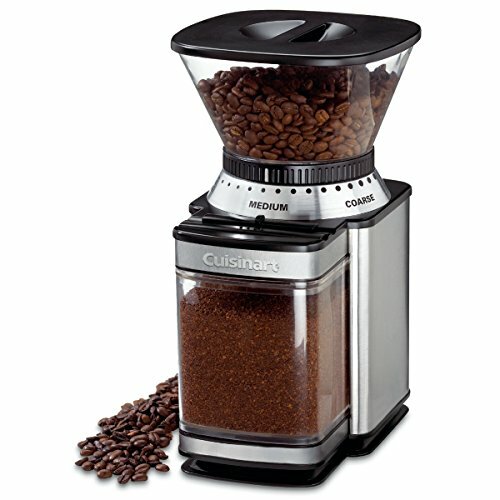 We think it’s the perfect entry-level manual coffee grinder for the aspiring coffee connoisseur. 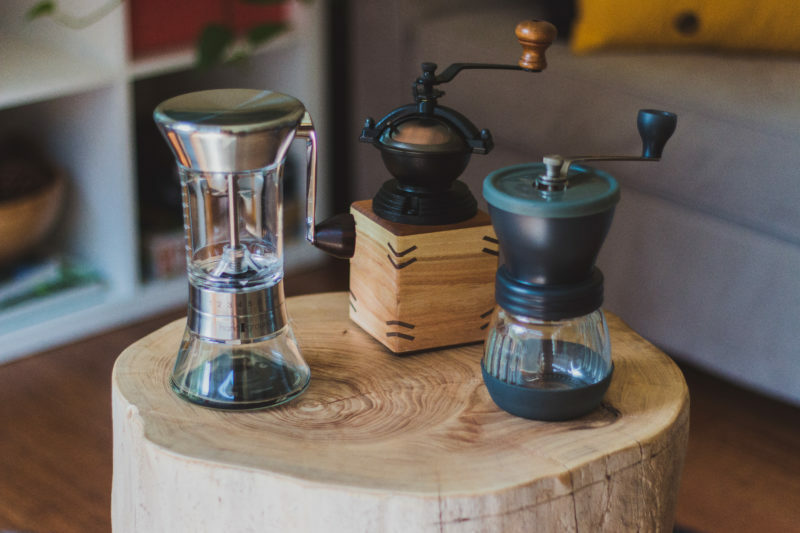 No matter which type of coffee grinder you choose, you’re on your way to more flavorful and enjoyable coffee that’s made extra special by the addition of your time, labor, and love. Just remember, how you grind your beans affects how good your brewed coffee is, so respect the beans, grind responsibly, and enjoy your next caffeinated creation.